Has anyone noticed anything different about the Sun? Anything unusual? Well, there’s nothing different, nothing unusual. The Sun is just going through its normal cycle. So, if you’ve looked lately, you’ve probably noticed that Sunspots are becoming rarer. The Sun goes through cycles. These cycles are measured by the number of Sunspots seen on the Sun’s surface, that is, the Earth-facing side. Each cycle lasts for about 11 years, with slight variations of time in each cycle. The solar cycle was discovered in 1843 by Samuel Heinrich Schwabe, and using other observations, reconstructed the cycle back to 1745. Prior cycles were reconstructed from observations going back as far as Galileo and others in the early 1600’s. We are presently in cycle 24. Right now, the Sunspot number is decreasing, and it has been for some time. Let’s look at the numbers. Cycle 24 peaked in April, 2014 with 101 Sunspots, the weakest in a hundred years. There was only 1 day in 2014 with no Sunspots. 2015 had 0 spotless days. 2016 had 32 spotless days. 2017 had 104 spotless days. At the end of 2018, there were 221 total spotless days, yielding a yearly percentage of 61%. The Sun produced a small group of Sunspots on the first day of 2019, and they rotated around the Western limb of the Sun. Now we have had 48 spotless days. All of February was spotless, yielding a 2019 yearly percentage of 73%. Sunspots have a magnetic North and South Pole. The poles align with the Sun’s equator. Every solar cycle, the Sun’s poles reverse, as do the sunspot’s poles. On March 5, a small magnetic disturbance started to appear, but was not counted as a sunspot yet. Today it is number 2734. This disturbance was oriented perpendicular to the Sun’s equator. The pole of one sunspot in January was oriented opposite to the Sun’s poles. Does this mean that the poles are about to reverse and usher in a new solar cycle? Perhaps. Keep watching. The minimum is still deepening; it has been predicted to “peak” some time in 2019-2020. But even with this minimum, there is still activity to be observed. There is still the frequent small prominence, flare or CME (Coronal Mass Ejection). And then there are the “holes” in the Sun’s atmosphere (coronal holes) that let stronger than normal streams of solar wind (charged particles), target the Earth’s atmosphere and produce those awesome auroras in the high latitudes. So if you have a solar telescope, keep watching, it’s not hopeless. Keep checking back, we’ll keep you updated. The comet is now at about magnitude 5. That’s just bright enough to be seen without optical aids under a dark sky. If you don’t have dark skies, you can still see it with only binoculars. The above picture comes from the Czech Republic, taken on December 9th. It was a 30 second exposure, proving that you don’t have to have a big telescope for astro photography. You can see Orion just above the horizon in the lower left of the photo and Taurus in the upper left. The comet will be at its closest point to Earth on Dec. 16th and located in Taurus just West of the Pleiades. So get your camera, binoculars or scope, and, happy hunting. Have I (Astronut) been missing something, or is space travel so commonplace now that “they” don’t bother to talk much about it? What am I talking about? I’m talking about the latest Mars lander by NASA. I admit, I don’t watch a lot of news, and every once in a while, someone will ask me about something they saw on the news, and I missed it. I also admit, that when I do see, or hear, something about space, it usually amounts to about only a 1-2 minute “blurb”. So, what’s NASA up to now? There’s a new Mars Lander on it’s way to Mars. It’s scheduled to arrive on November 26. Every lander so far has relied on the lander itself to send back information after landing. Or none if it crashes. This time, there are 2 cubesats accompanying the lander, named Insight. The cubsats will be deployed before Insight begins its descent into the Martian atmosphere and monitor Insight’s descent and landing. This way, we’ll have near real time information coming back. They won’t have to wait for hours to know if Insight made it safely to the surface or is laying in a heap. This is a first. Insight is scheduled to land on Mars about 3 pm on Monday, November 26. NASA is planning to televise coverage of the event beginning at 2 pm. Launched on May 5, InSight marks NASA’s first Mars landing since the Curiosity rover in 2012. The landing is the start of a two-year mission in which InSight will become the first spacecraft to study Mars’ deep interior. Insight will drill into the Martian soil, but more importantly, using seismic instrumentation, Insight will explore and “test” the sub-surface structure for the first time. A number of European partners, including France’s Centre National d’Études Spatiales (CNES) and the German Aerospace Center (DLR), are supporting the InSight mission. CNES and the Institut de Physique du Globe de Paris (IPGP) provided the Seismic Experiment for Interior Structure (SEIS) instrument, with significant contributions from the Max Planck Institute for Solar System Research (MPS) in Germany, the Swiss Institute of Technology (ETH) in Switzerland, Imperial College and Oxford University in the United Kingdom, and JPL. DLR provided the Heat Flow and Physical Properties Package (HP3) instrument, with significant contributions from the Space Research Center (CBK) of the Polish Academy of Sciences and Astronika in Poland. Spain’s Centro de Astrobiología (CAB) supplied the wind sensors. So, why the fuss about two tails? Almost all comets have two tails. The sun-warmed nucleus of a comet spews a mixture of dust and gas into space. Quickly, the mixture separates into two distinct tails: The gaseous “ion tail” is pushed straight away from the sun by solar wind. The weightier dust tail resists solar wind pressure and aligns itself more or less with the comet’s orbit. In the above video, the long ion tail points up and left; the stubby dust tail points up and right. Comet Machholz-Fujikawa-Iwamoto is plunging toward the sun on a nearly-parabolic orbit that will take it just inside the orbit of Mercury. Closest approach to the sun (0.38 AU) is on Dec. 3-4; closest approach to Earth (0.67 AU) is Nov. 27th. Amateur astronomers can find it–and its two tails–shining like a star of 8th magnitude in the constellation Virgo in the pre-dawn sky (see details below). I have been informed that a Scout leader was asking if we could do a program with their group for the astronomy badge. My apologies for the miscommunication. I understand that you are asking for a presentation around December 28/29. The answer is a resounding “Yes”. I am a registered badge councilor and have a PowerPoint presentation explaining what is required for the participants to earn their astronomy badge (whether Cub Scout’s patch and/or academic pin or the Boy Scout’s badge). And since part of earning the award is looking through a telescope, we will have ours there. Unfortunately, I have no contact information for the Scout leader. So, I’m hoping you will see this post and contact me through our website. Just go to the left hand side of the “Home” page, click on “Contact” and fill in the information. I will get the message and we can make arrangements. I also heard that our Astronomy Night at Colt Creek on October 13th was a great success. I’m sorry I could not personally have been there to experience it. Oh, by the way, let me reiterate: we do presentations/observing sessions for any group (schools, Scouts, church, birthday party, private community, etc. ); you name it, we do it. Remember, “We bring the universe to you”. So, what’s the latest IPAS news? We have a new venue. Where? Bartow, FL. And what do we do there? Just what we do everywhere, sort of. It’s called sidewalk astronomy. So, what is sidewalk astronomy? Sidewalk astronomy is no more than amateur astronomers, like us, setting up our telescopes in a public place (like on a busy sidewalk) and letting anyone who comes by look through the scopes at whatever we find in the night sky to see. We answer any questions about astronomy and the celestial objects we’re viewing. Our purpose is to educate anyone interested in the basics of astronomy, let them see the wonders of the universe and hopefully, find a few new amateurs who may want to join us. After two months at Bartow, we’re pleased to tell you that it has been a success. Many people have come by and viewed the universe through our scopes and enjoyed the view. So come on out to Bartow on the third Friday of each month, visit the many vendors there to see what they have to offer and visit us and see the universe up close. It will be an experience you won’t forget. See you there. I suspect that Lunar and solar eclipses occur more frequently than a lot of people think. But what I think doesn’t matter. What does matter, is that there will be a total Lunar eclipse in January of 2019, January 20-21 to be precise. The really good news for us here in Lakeland is that the total eclipse will be visible from Lakeland, Florida, from start to finish. I hope you all are as excited about this as I am. If not, maybe this will help spur you on. We, the Imperial Polk Astronomical Society, will be doing a Lunar Eclipse Watch that night. Florida Southern College will host the event for the night. The college is located at 111 Lake Hollingsworth Dr., Lakeland, Florida. We will do a presentation beginning at 7:00 pm in the Annie Pfeiffer Chapel. We’ll tell (and show) you how and why eclipses happen and what to expect from this one. After the presentation, we’ll have time for a short Q & A session. Then we’ll move outside where we’ll have telescopes set up to view some of the wonders of the universe before the eclipse begins. We’ll view galaxies, far, far away, nebulae in our own galaxy, and our own solar system planets. Then, when the eclipse begins, we’ll “focus” our scopes on the Moon and track it through the stages of eclipse. We’ll be there from start to finish. So, when does it start and end? The presentation starts Sunday, January 20 at 7:00 pm sharp. The eclipse starts at 9:36 pm. The eclipse ends Monday, January 21 at 2:48 am. Obviously, Lunar eclipses occur at night. One good thing about this one is that Monday, the 21st is a legal holiday, so maybe you’ll have the day off. Our thanks to Florida Southern College. If you have any questions, you can contact us right here through our website. Back in March, I posted an article about what we do. But I also want you to know a little bit about how we do things. I hope you will allow me to be honest with you, and I hope no one takes offence at what I say. Some have described me as being “brutally” honest, and I admit that I am. I usually like to get right to the point and much of the time, I don’t know what diplomacy/tact means. So, if I may express myself, I’ll try to get diplomatically/tactfully to the point. I, we, at Imperial Polk Astronomical Society love what we do, whether its looking through a telescope at a distant galaxy under clear skies, learning about a new astronomical discovery, or standing in front of a group of people, explaining the wonders of the universe; it’s a passion. When it comes to our presentation/observing sessions, I personally enjoy every aspect of these sessions. I enjoy having a group who are eager to learn more about all of the “stuff” out there. I especially enjoy having the kids in attendance. They always ask the most challenging questions. And after the presentation, when the weather permits, we get our scopes out and view the wonders of the universe “up close and personal”. It’s always a thrill to see the expressions on faces as they look through a telescope, especially when it’s for the first time, and hear the familiar “Oh wow!” when they realize they’re looking at something millions of light years away, or just billions of miles away. A few people come to our events because they’re amateur astronomers and want to join a group of like-minded people. Others come to learn something about astronomy from the presentation and enjoy the view through the telescopes. Some bring a telescope to have us check it out or to learn how to use it. Others come mainly to get a view through the scopes (and that’s OK), but usually enjoy the presentation anyway. Recently, I’ve had some calls asking if our event is cancelled because the weather doesn’t look good. And I know that people don’t come when the weather is not so conducive to looking through a telescope. But let me urge you to come anyway. The presentations are educational, basic enough that anyone 6 to 96 (or more) can understand it, and entertaining as well. We encourage participation in our presentations. We welcome any questions about the presentation or astronomy in general, and we’ll tell you what is fact and what is theory. So, what’s my point? Just this: Our “regular” Astronomy Night presentation is always indoors or at least under cover where the weather doesn’t bother us and can’t stop us. Most are indoors with A/C or heat so its comfortable. This means that the show goes on whatever the weather may be. Obviously, if the weather is bad, we won’t be getting the scopes out for viewing. They don’t take too well to rain. But the presentation goes on “rain or shine”! So don’t let the weather stop you from coming out. Obviously, for observing sessions only, if the weather is bad, there will be no viewing. But if you live in our Central Florida area, you’re familiar with our weather, especially in the Summer months. But, just because it’s raining where you are now, that doesn’t mean it’s raining a half mile away. Nor does it mean that it will be raining a half hour from now. We have seen the rain and clouds dissipate within 30-45 minutes and yield to clear (or clear enough) skies. So, brave the weather, come out, and hope for the best. It has happened. Well, there it is. I just want everyone to know that weather doesn’t stop us. We’re serious about what we do and a little rain won’t stop us. A hurricane, yes. A little rain, NO! So, I hope no one has been offended, I’ve been as “diplomatic” as I know how. I welcome any questions or comments you may have. Back in mid-March, we posted an article about sending your name to the Sun on the Parker Solar Probe. If you got your name in, you’re about to “touch the Sun”, as the mission says. The Parker Solar Probe launched on Sunday, August 12 at 3:31 am. The probe, designed to travel through the Sun’s corona, the outer layer of its atmosphere, at a temperature of 2,500 degrees F, at a distance of 3.83 million miles from the Sun’s surface, just completed (on October 3) its first Venus fly-by for the first gravity assist to gain speed. Parker is scheduled for its first solar encounter from October 31 through November 11. Over the course of its planned seven year mission, Parker will use seven Venus gravity assist maneuvers to increase its speed to 430,000 mph and make 24 solar orbits through the Sun’s corona. Some of the questions they’re seeking answers to are: Why is the corona of the Sun hotter than the surface? What causes “holes” in the corona? Why is the magnetic field different strengths at the equator and the poles? Stay tuned, we’re sure you’ll want to know more about the Sun as the data comes in. Flying Spiders? And Space Weather? Believe it or not, some spiders “fly”, it’s called ballooning, and apparently it’s due partly to space weather. So, how do they do it and what does space weather have to do with it? This comes from the spaceweather.com website: Our thanks to Dr. Tony Phillips and spaceweather.com. SPIDERS AND SPACE WEATHER: Did you know that spiders can fly? Biologists call it “ballooning.” Spiders spin a strand of silk, it juts into the air, and off they go. Airborne arachnids have been found as high as 4 km (2.5 Mi) off the ground. Originally, researchers thought spiders were riding currents of air, but there’s a problem with that idea. Spiders often take flight when the air is calm, and large spiders fly even when air currents are insufficient to support their weight. It’s a mystery. Scientists from the University of Bristol may have found the solution. In a paper published in the July 5th edition of Current Biology, they proved that spiders can propel themselves using electric fields. 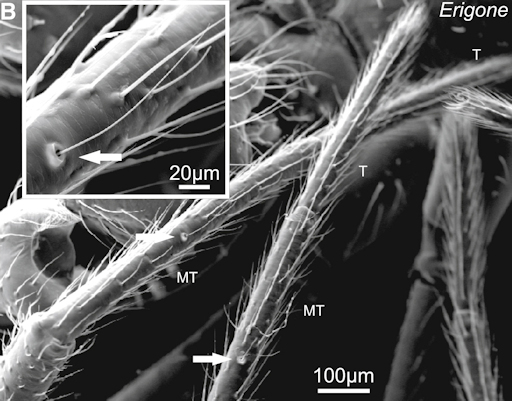 “We exposed adult Linyphiid spiders (Erigone) to electric fields similar to those which naturally occur in Earth’s atmosphere,” explains the paper’s lead author, Erica Morley. “Spiders showed a significant increase in ballooning in the presence of electric fields.” A remarkable video of their experiment shows one spider flying when the fields were switched on, then sinking when the fields were off again. 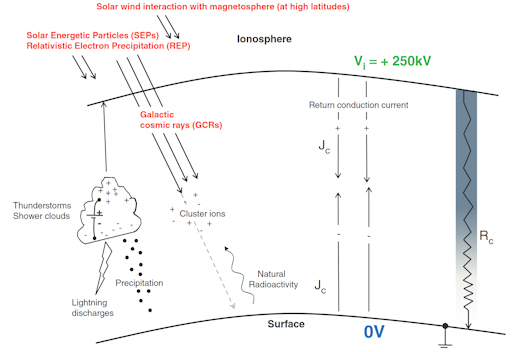 Above: This diagram, borrowed from K. A. Nicoll’s review paper “Space Weather influences on Atmospheric Electricity,” illustrates the role of thunderstorms and cosmic rays in creating Earth’s electric fields. The electric fields spiders use for propulsion are part of Earth’s global atmospheric electric circuit (GEC)–a planet-sized circuit of electricity that researchers have known about since the 1920’s. In a nutshell, thunderstorms help build up a charge difference between the ground and the ionosphere 50 km (31 Mi.) overhead. The voltage drop is a staggering 250,000 volts. This sets up electric fields linking Earth to the edge of space. Cosmic rays ionize Earth’s atmosphere, turning it into a weak conductor that allows currents to flow through the GEC. Spiders have been observed using multiple strands of silk that splay out in fan-like shapes. Instead of tangling as they move through the air, the strands remain separate. Are they repelled by an electrostatic force? The work of Erica Morley and her collaborator Daniel Robert provides insight. Years: During the 20th century, fair weather atmospheric voltages at sites in Scotland and the UK decreased by factors of ~25% due to a long-term decrease in cosmic rays. [ref] That slow trend is now reversing itself as cosmic rays intensify again. Could the migration patterns of ballooning spiders be affected by space weather?